I have been wanting to make my next batch of scones. I have been seeing some amazing scone recipes on different blogs and have pinned one or two of them to make at another time. But there were some carrots that have been sitting in my refrigerator begging to be eaten. Yes I could have cooked them up or roasted them, but I thought scones were a much better idea. So I had no choice but to make these carrot scones. 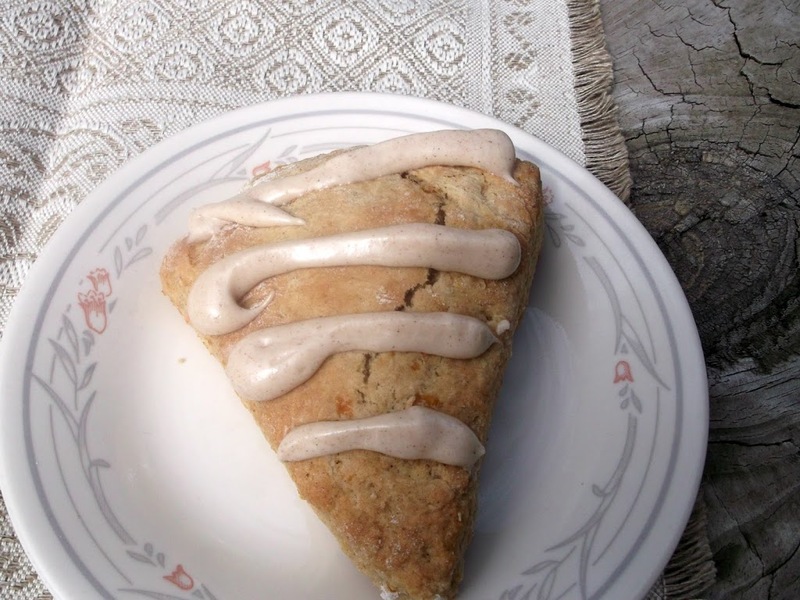 Mike loves carrot cake with cream cheese frosting so I had a vision of what I wanted my scones to taste like. I looked on the web to see what was out there. There were a few recipes, but nothing quite what I had envisioned. So I kind of did my own thing on these scones. Yum, I think these may have been the best scones I have made so far. I have to say that my family all loved them. Even my youngest child Adam who usually is not too much for things like scones enjoyed them. The carrots and the sour cream I believe made these a little more moist than the past scones I have made. The cinnamon cream cheese icing topped the scones off quite nicely and gave them a little sweetness. Combine the flour, sugar, salt, baking powder, baking soda, and cinnamon into a large bowl. Using a fork cut the butter into the dry ingredients until there are no chunks of butter left. In a separate bowl slightly beat the egg and mix in the milk, vanilla, sour cream and carrots until well mixed. Add the wet ingredients into the dry ingredients, making sure not to over mix. Form into 2 balls. The mixture will be slightly sticky. On a slightly floured surface knead dough until dough is smooth. Pat out the dough to make about an 8 inch circle. Cut circle into 6 triangles with a pizza cutter or a knife. Place scone on a lightly greased baking pan, making sure that the scones are not touching. Bake in a 425 degree F oven for about 14 minutes. Scones should be lightly browned. Beat the cream cheese until nice and fluffy. Add the vanilla and beat that in to the cream cheese. Beat in the powdered sugar and vanilla until smooth. Add cream to make it the right consistency. You can put icing into a baggy and snip one end off and pipe the icing onto the scones or you can frost them. 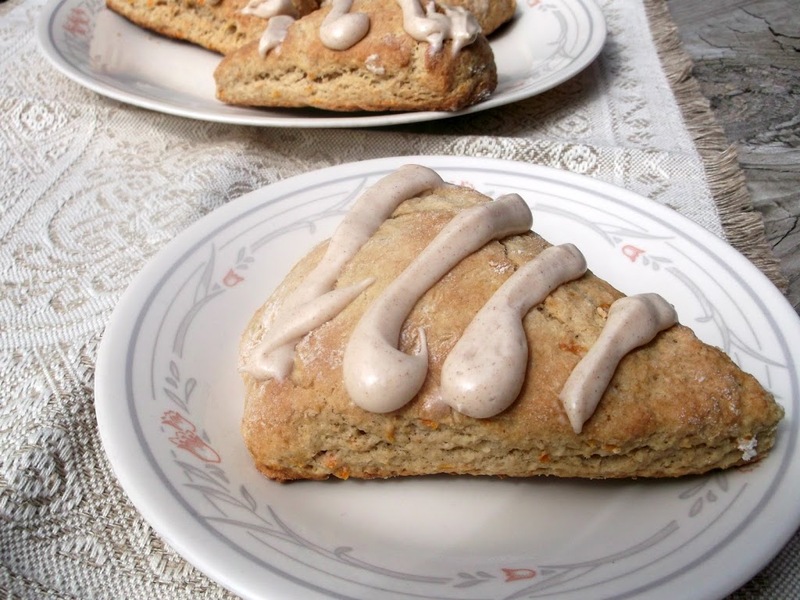 I would never have thought to make carrot scones…the cinnamon icing makes them extra special. They look and sound terrific! 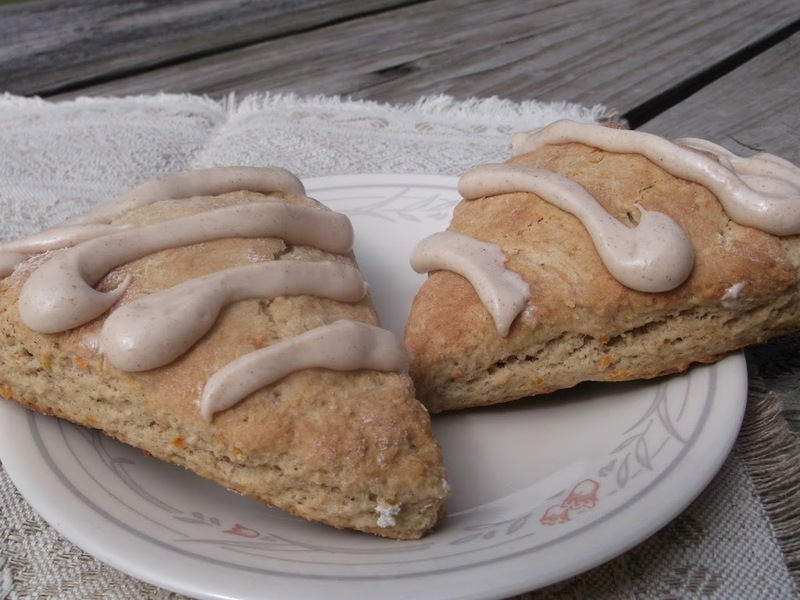 I never had carrot scones…and they must taste delicious with the icing…love the combination. I adore CREAM CHEESE frosting. WOW.